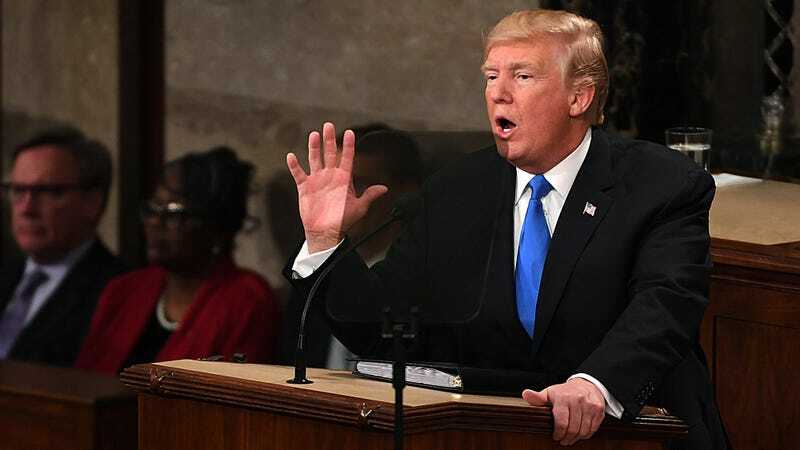 WASHINGTON—In a State of the Union address largely devoted to what he described as “our gravest national security threat,” President Trump used his speech Tuesday night to warn the American people of the severe danger posed by toys coming to life when their owner leaves the room. “Folks, as soon as you close the door, they’re up and about doing God knows what, and then the instant you return, they rush right back to the exact same place they were before, leaving you none the wiser,” the president said in a forceful condemnation of “Lego guys, G.I. Joes, Barbies, and stuffed animals,” whom he accused of committing “horrible crimes” against Americans as soon as no one is looking. “A lot of people don’t want me to talk about this, but I’m not afraid to speak the truth: Toys have infested our country and our very homes, posing an enormous danger to anyone who turns their back on them. These violent dolls and action figures put our loved ones at risk, and if Congress does not act, I will be forced to exercise my power as commander-in-chief and use military force to eliminate this deadly menace.” Trump also expressed concerns regarding the “death and destruction” caused by witches and other monsters that emerge from bedroom closets after the lights go out.